Escape to the sandy beach of Edgewater to enjoy beach life in the city. A nature getaway to swim, play, picnic, and relax with your family and friends. Lakefront Reservation provides vistas of Lake Erie and downtown Cleveland, as well as myriad recreational opportunities. Edgewater Beach, located in lower Edgewater Park, has something from everyone. Make a day of it and rent a cabana along the shoreline or join a pick-up game of beach volleyball. Stroll along the beach while enjoying a delicious scoop of Honey Hut ice cream from Eats and Treats concession stand. Experience panoramic views of downtown Cleveland from the shore and experience a breath-taking sunset. 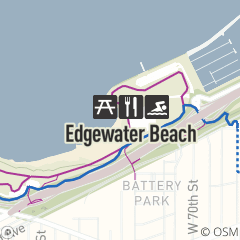 Edgewater Beach is accessible from both the lower section of Edgewater Park as well as the Upper section. The 2400 foot beach features 1000 feet of swimming access. The westernmost portion of the beach is dog friendly. The beach also provides kayaking access. Just minutes from downtown Cleveland, Edgewater Beach is located between the Memorial Shoreway (Route 2) and Lake Erie. Cleveland Metroparks has been operating Edgewater Park since 2013. Looking to fish? Perch, walleye, smallmouth bass and steelhead are some of the fish you may find in Lake Erie. Head to Edgewater Beach today and experience this urban gem for yourself. The park is open till dusk each evening all year round. All patrons are required to follow Cleveland Metroparks waterfront rules and regulations. For the safety of all patrons, lifeguards will enforce any additional rules deemed necessary. Lifeguards have complete authority at all times while on duty, under the direct supervision of the Aquatics/Facilities Manager.